Your references are so much more well-read (is well-watched a phrase?) than mine. Thanks for the lovely facts. These are so interesting! Thank you so much for posting these facts! One of my favorite Cabin Pressure moments is Arthur killing a man. The most innocent character kills a man and gets away with it. Thanks so much for four and a bit series of such clever, lovable fun. I shall be so sad when it's over, but can't wait to hear how they all end up! These are awesome! I got the "Hamilton" Fawlty Towers reference but now those others seem so obvious! Thanks for posting these! So, if I don't listen to these upcoming two episodes, does that mean CP doesn't really end? "Thank you for flying MJN Air" is one of many stand-out moments in this episode, it cracks me up every time. Nice notes on the names as well, I'd never even thought to make a connection. These blog posts are such a great way to lead up to Zurich, really enjoying them! I did not get that reference at all, really glad I read this before I listened to Boston again tonight. Will have to watch the Fawlty episode again afterwards as well. OH MY GOD? I already loved Cabin Pressure (& Souvenir Programme) and now I find you've included a reference to Nancy Mitford, and in particular Uncle Matt?? I grew up with those characters to the extent that it's like a family member made a cameo. Ahhh, I salute you, Finnemore. I am so thrilled you're doing these! 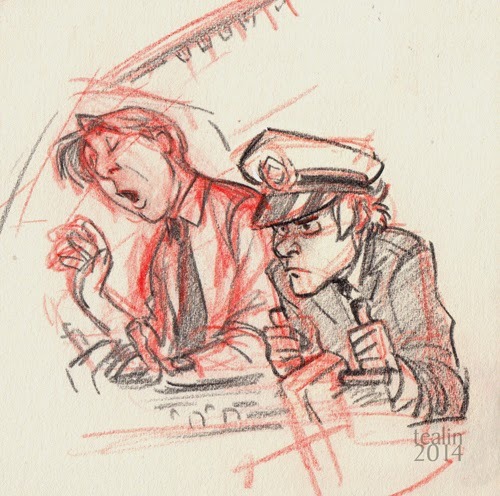 Thank you for noticing the Tumblr post about the advent timing for a Cabin Pressure re-listen, and thank you SO MUCH MORE for interacting with it. I've gone all mooshy! Now I want a dark radio sitcom in which Arthur accidentally kills people and becomes Prime Minister. Captain Wing Commander Sir Arthur Shappey, fresh from completing his record-breaking trip around the world (including flight under the Sydney Harbour bridge) finds himself winning a seat in the 2015 General Election and swiftly (at the request of his party colleagues) finds himself in the Cabinet. Cabinet Pressure charts his rise through the ranks by accidentally killing off his political rivals, resulting in him being made Prime Minister. Thank you so much for the Fawlty Towers references, I love Cabin Pressure as much as I love FT.
"your move spacey"! I nearly laughed up a lung at that! I never knew the faulty towers connection, but for some reason the face of the Mr Hamilton character popped into my head while listening.